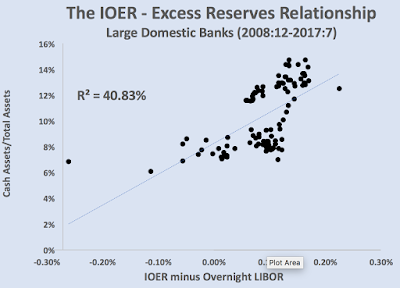 Back in the glory days of macroeconomics blogging there was a lot of electronic ink spilled over interest on excess reserves (IOER). Commentators, including myself, debated whether IOER mattered to the recovery or if it was just another innocuous tool for the Fed to control interest rates. I generally argued that the IOER did matter for the economy--it was more than just a new tool. It began with a call I made in October 2008 that the introduction of IOER that month was likely to be contractionary. In later conversations, I acknowledged that, yes, the Fed does sets the aggregate level of reserves. Even so, I retorted, banks could still influence the composition of all those reserves based on their investing decisions. These decisions, in turn, could be influenced by the level of IOER. That is, if IOER were set high relative to other safe asset yields then banks might decide to invest in excess reserves rather than in other safe assets like treasury bills. This could stall the 'hot potato' process and affect the recovery. For example, imagine the economy starts heating up and, as a result, the demand for loans picks up. Banks facing this increased pressure for money creation might opt to invest in excess reserves instead of loans if the risk-adjusted return on excess reserves were high enough. That could happen by raising IOER sufficiently high. Consequently, IOER mattered to macroeconomic policy and needed to be set appropriately. The above paragraph roughly summarizes my position during the many IOER debates that took place over the past decade. Needless to say, I got plenty of pushback and there were many spirited debates. These exchanges sharpened my thinking on the topic. Here, for example, is a long write up from Cardiff Garcia at FT Alphaville on one such debate in 2012. Those were fun times, but folks generally moved on to other conversations. One person, though, who kept the IOER conversation going is George Selgin. He has written extensively on IOER, most recently in a 60-page testimony to the House Committee on Financial Services. 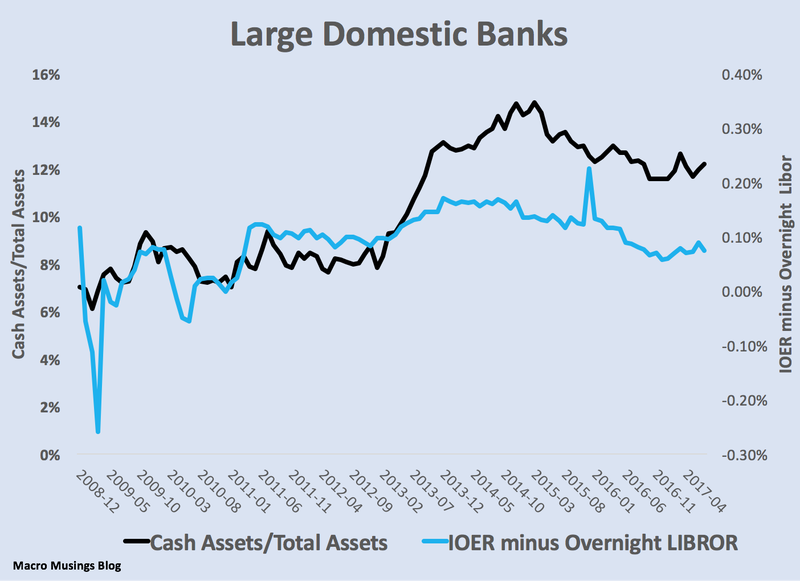 In it, Selgin argues that the Fed has, in fact, set the IOER too high and this has been a drag on the recovery. Along these lines, he presented a chart on page 20 that shows what appears to be a systematic relationship between (1) an IOER and comparable market interest spread and (2) the relative demand for excess reserves. The chart was intriguing, but its sample period did not span the whole IOER period. So I wanted to see if the relationship was robust across the period. Also, I thought it would be useful to look at the actual holders of the excess reserves. 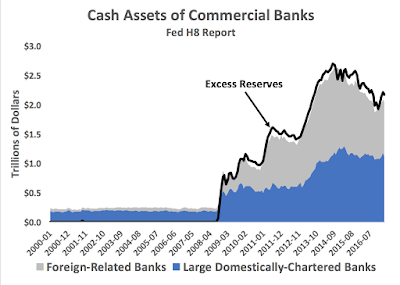 The figure below shows the combined cash assets of "large domestically-charted banks" and "foreign-related" banks as reported in the Fed's H8 report. These combined cash assets track excess reserves fairly closely. These two types of banks, then, are the main holders of excess reserves. 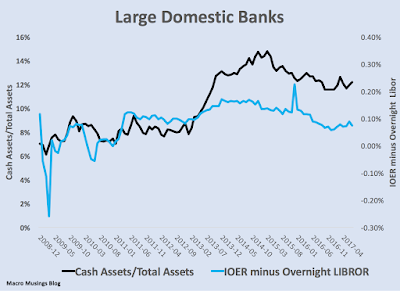 Following Selgin's example, I plotted the (1) spread between the IOER and the overnight LIBOR and (2) cash assets as percent of total assets. I did so for both the foreign-related and large domestic banks. 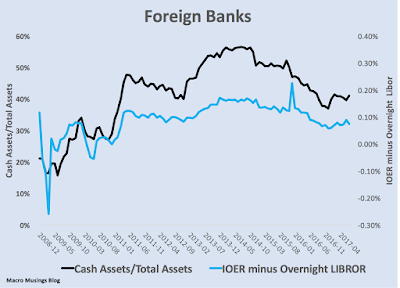 If the IOER spread does in fact cause banks to hold more excess reserves relative to other assets, then we would expect the banks share of excess reserves in the portfolios to go up with the spread. The figure below confirms that this is the case for the foreign-related banks for the period December 2008 - July 2017. The relative yield on excess reserves does seem to influence the real demand for excess reserves. The next figure puts these two series together in a scatterplot. The IOER - excess reserve relationship is strong with a R2of 73%. Next, I looked at domestically-chartered banks. There is still a positive relationship here, but it is weaker as seen in the next two figures. The last figure shows the relationship is not trivial--it has an R2of 41%--but it is nowhere near the strength of the foreign banks. 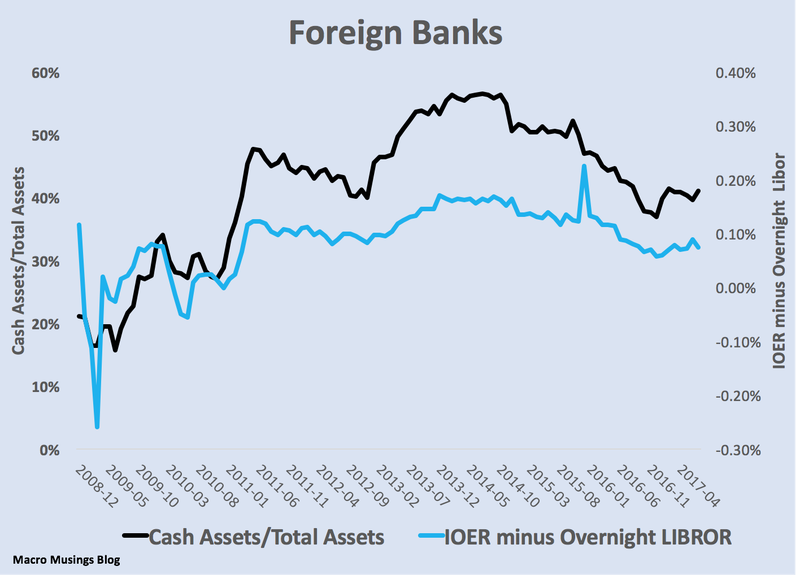 So for some reason the IOER-Libor spread creates a stronger incentive for foreign banks to hold comparatively more excess reserves. That is an interesting observation worthy of future exploration. The main takeaway, though, from the above figures is that it appears Selgin's claim is correct. 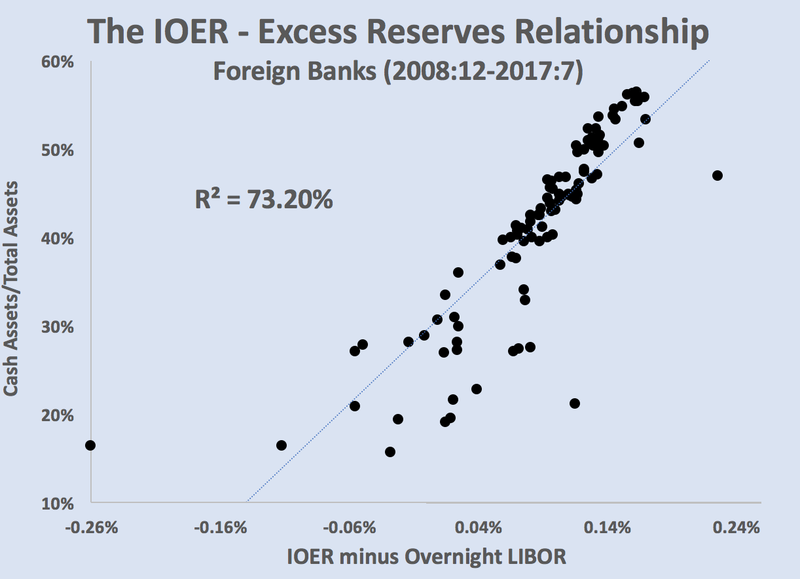 A rise in the IOER spread does seem to influence the relative demand for excess reserves, with the effect being strongest for foreign banks in the United States.This implies the IOER is more than just a new interest rate tool for the Federal Reserve. George Selgin may have just rekindled the IOER debate.